This works really well in Microservice Architectures – here, every service can implements its own /metrics endpoint that produces each and every conceivable metrics. This approach does not work that well when you want to use Prometheus to monitor performance metrics of (older) web applications served by a traditional LEMP stack (Linux, NGINX, MySQL, PHP). The reason for this is that a PHP application typically does not track metrics like the amount of processed requests or the average request time (or would need to gather this data by itself and then persist it in a database). There are multiple connectors available for integrating NGINX web servers with Prometheus – however, many of those just process the information available on the NGINX status page offered by the ngx_http_stub_status_module module (not enough detail for my use case), or require you to reconfigure the web server to send its data to another logging server (much too invasive for my cherished legacy application). The total sum of the “Upstream Time”, which is the time that NGINX spent on waiting for PHP-FPM or other FastCGI modules. The exporter starts its own HTTP server that listens on the configured IP address and port (by default, 0.0.0.0:4040). 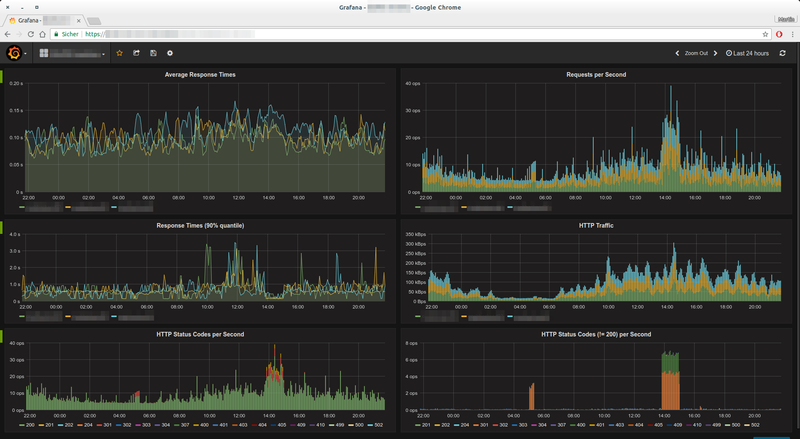 Using the URL http://<IP>:4040/metrics, Prometheus can then scape the respective performance metrics. The namespace name (app1, in this case) will later be used in the name of the exported metrics – for example, app1_http_response_time_seconds. The format (format) describes the format in which NGINX writes its access logs (for more information, refer to the documentation). Note that this unit file expects the executable to be located at /usr/local/bin/prometheus-nginxlog-exporter and the configuration file to be located at /etc/prometheus-nginxlog-exporter.hcl. Of course, you can adjust these paths as required.